In 1982, the Government of Canada patriated the Canadian Constitution, and in so doing, formally entrenched Aboriginal and treaty rights in the supreme law of Canada. 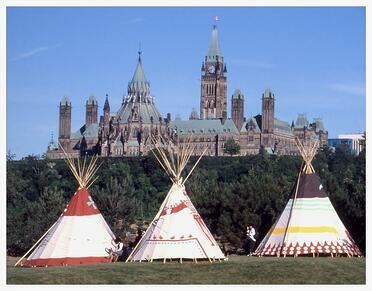 Section 35 neither confirms nor creates absolute Aboriginal rights. It does confirm “existing Aboriginal or treaty rights” that had not been extinguished by surrender or legislation before 1982. On the other hand, Aboriginal rights and treaty rights existing after proclamation of the Constitution Act, 1982 now receive significant legal protection under Section 35. Existing Aboriginal land rights can no longer be extinguished without the consent of those Aboriginal Peoples holding interests in those lands. Aboriginal consent may be required to give effect to legislation purporting to extinguish Aboriginal land rights, even if compensation is paid. Finally, government regulation of Aboriginal land rights may still be possible, if appropriate and meaningful consultation is undertaken with the affected Aboriginal communities. The repatriation of the Constitution has contributed to the creation of space for Canada’s Aboriginal Peoples and governments to work towards the recognition, respect, and reconciliation of Aboriginal rights and title. The repatriated Constitution also set the stage for the Supreme Court of Canada to begin to weigh in on issues related to Aboriginal rights and title. The underlying belief was that once treaty and Aboriginal rights were recognized in the Constitution as “constitutional rights” that recognition provided a legal status protecting Aboriginal rights and title. In reality, the burden fell upon Aboriginal Peoples to define, through litigation, the nature and quality of those rights. Constitution Act, 1982, being Schedule B to the Canada Act 1982 (U.K.), 1982, c. 11. Here's an article that gives some background on how Métis Peoples came to be included in the Constitution. "Harry Daniels, the Man Who Put Métis in the Constitution." We provide more insight on the significance of Section 35 Constitution Act, 1982 in our public and on-site training.